This looks like something yummy for lunch. And I think hot smoked salmon would be a tasty substitute for trout! Asparagus is in season, hoorah! 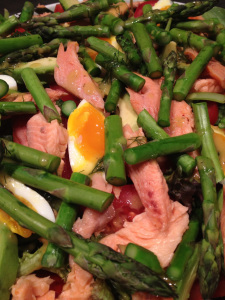 This salad is all about asparagus and smoked trout, simple and delicious without too much effort! I serve this with some crusty bread, it really doesn’t need anything else. In a small bowl whisk the oil, vinegar, honey and mustard. Remove the whisk and stir in the dill, a little salt and a good grinding of pepper. Bring a small pan of water up to the boil. Pop the eggs in, bring back to the boil and boil for 5mins.